A thorn-bearing citrus branch by Marilena Pistoia, showing at the Hunt Institute. © 1984 Arnoldo Mondadori Editore, Milan. 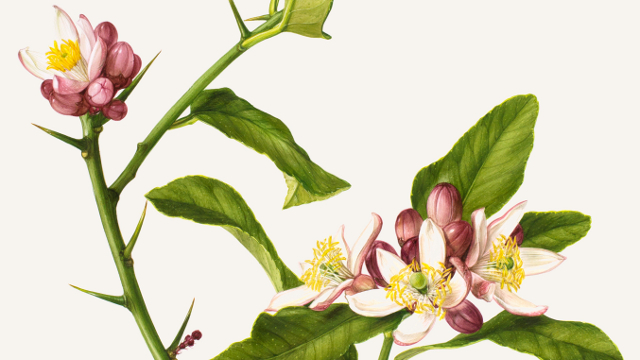 Botanical art usually makes people think of flowers, but in fact, scientific illustrators routinely document and find beauty in every part of the plant, stem and root, leaf and fruit. That includes what may seem to be the least attractive botanical anatomy: thorns, spines, and prickles. 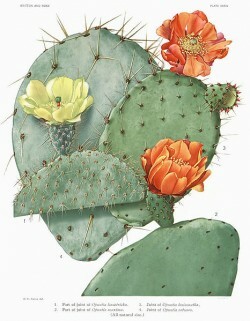 Spine-bearing prickly pear cactus by Mary Emily Eaton, from The Cactaceae (1919-1923) by Britton et Rose. Image filtered by Daniel Schweich. These defensive structures are rampant throughout California’s vegetation, both native (like prickly pear and agave) and invasive (like foxtails and teasel). Such fierce subjects have inspired many of the state’s widely-known botanical artists, including Jeanne Russell Janish, the first woman to get a geology MA from Stanford. Several inspired illustrations will be featured in a new exhibition called “Dangerous Beauty: Thorns, Spines and Prickles,” opening September 18 at CMU’s Hunt Institute in Pittsburgh. It may come as a surprise that thorns, spines, and prickles are each anatomically distinct achievements in sharpness. Spines are simply modified leaves. Thorns, however, grow from stems, and like any plant stem they can branch and grow leaves. Both spines and thorns are as much a part of the plant’s body as your finger is of yours; they are hooked in to the plant's internal transport system just like your finger is wired up with blood vessels and nerves. Prickles, meanwhile, are more like fingernails—mere extensions of the plant’s epidermis with no deeper connectivity. 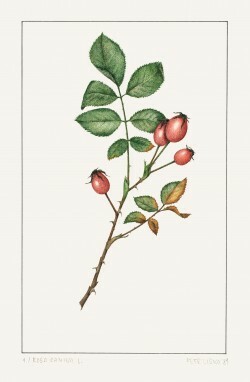 Prickles on a rose branch by Petr Liska, showing at the Hunt Institute. © 1981 Petr Liska. These precise botanical definitions are often at odds with informal terminology, leading to contradictions such as the prickly pear cactus. It has no prickles. Prickly pear cactus belong to the genus Opuntia, which extends far beyond the deserts of the southwest United States and northwest Mexico, as far as northern Alberta! (The species there is named Opuntia fragilis, which is not as ironic as it sounds—the fragililty refers to the easily broken stem, not temperature tolerance). In California, prickly pear season is just starting, which offers a rare opportunity to eat not only local, but native. As you carefully peel your cactus fruit, please note that it is covered with spines, not prickles. 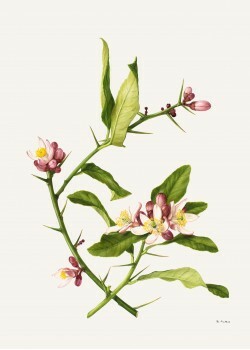 Thorn-bearing Citrus medica (Citron) by Marilena Pistoia, showing at the Hunt Institute. © 1984 Arnoldo Mondadori Editore, Milan. Your friends will no doubt demand to know where to find true thorns, and excellent local examples are California's many iconic citrus trees. The difference between a lemon thorn and a rose prickle becomes obvious once you try to remove them. Prickles snap right off with a satisfyingly clean break. Just like ripping off . . . Never mind. Anyway, breaking off a thorn usually tears right into the branch, because thorn and branch are knit together by vascular tissue. All three flavors of sharp will soon be on display at the Hunt Institute, if you happen to find yourself in Pittsburgh between September 18 and December 18. For a shorter excursion, you can head to the library to find books illustrated by the three California artists whose work will be part of "Dangerous Beauty". Check out "Flowers of the Southwest Mesas", illustrated by Janish, "A Natural History of Western Trees", illustrated by wood engraver Paul Landacre and the botanical prints of linocut artist Henry Evans. And the next time you're stabbed by a plant in a garden or in the woods, you can take your mind off the pain by attempting to determine whether the offending structure is a thorn, a spine or a prickle.